HauteSpot's Adventures in Wireless and Video: Could I get any more tired? So, after a 26 hour transit from San Luis Obispo to Kuala Lumpur, then setting up all day on Sunday, I finally got to sleep after being awake for 44 hours straight. That is a record for me. I only slept for 6 hours and then we started the trade show. 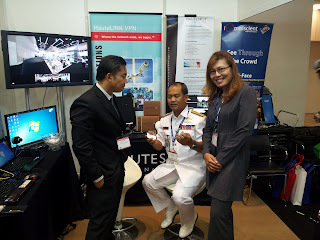 The XV Asia Technology booth was packed to the gills with products, people and collateral. As a late arrival to the show, XV Asia did not get the best location, but this did not seem to matter. We had a good, steady flow of people who were all interested in virtually all of the products. The Immersive Video Dodeka 2360 camera was a great draw and people were very interested in the fully spherical view that the system captured. It brought a lot of people to the booth. Once at our door, they almost all asked about the Global Emergency Resources eWRAP, which inevitably led to a discussion of wireless, then the challenges of moving video, which led to the MVE product based on Sentinel AVE technology and the microNVR. As this is a military show, there were lots of weird products that I will try to capture over the next two days. Anyway, time for dinner, then bed. Hopefully I will sleep through the night. Tomorrow we have delegations from Russia, Thailand and the Philippines coming to visit us. Get some more pictures of the show.